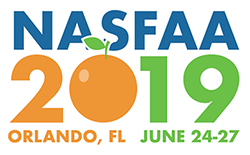 Access NASFAA Live, June 24 -27, 2019, from the convenience of your computer or mobile device. Unable to attend in person? By registering for "NASFAA Live"—NASFAA's interactive, livestreaming conference option—you can actively participate in the 2019 NASFAA National Conference from the comfort of your own desk or office conference room. *The opening session will not be available on-demand; posted schedule will indicate this and other sessions that will not be available for on-demand viewing. Spread the knowledge. A single NASFAA Live registration can be viewed by unlimited participants, which means for the cost of just one conference registration, everyone at your school can participate. Avoid the hassle. With NASFAA Live, there's no need for travel, packing, meals out, booking flights, scheduling hotel stays, and returning to a backlog of work and emails post-conference. Whoever buys the NASFAA Live registration, must use their own individual NASFAA account to access the livestream and supporting materials. It is against NASFAA's Terms of Service to share or distribute your NASFAA account credentials. Only one login is given per registration, so only one streaming session may be used at a time. Users cannot watch NASFAA Live from two devices simultaneously, but can easily move from one device to another by logging in again. Previous sessions will be disabled. The registration fee for NASFAA Live will be $635 for NASFAA Members & $735 for non-members. Connection information for NASFAA Live will be available here and distributed via email in June. Remember: You can invite everyone at your school to participate with you. 2019 NASFAA Live is sponsored by Earnest.